Taste McLaren Vale is working with the Unearthing Wine group from Adelaide to unearth new wines and new wine lovers. We are looking to produce small run wines under the Unearthing Label. Let Charlie (from Unearthing) explain all about the concept below. The wine industry is highly competitive across South Australia, and in fact, the world. There have been long term issues around the general economy, wine gluts, export doom, and storage costs, and so the industry is doing it hard. We hear that. But let’s face it, wine lovers love fun, and they also love sharing and gathering socially, enjoying a good wine with friends. So, it’s time to unearth for our wine lovers, some good wine. Recent news suggests we currently drink less, but what we are drinking is of better value. This is good news; however, some would argue that at times like the tight economy we currently face, we drink more! Regardless, Charlie-Helen Robinson, Founder of Unearthing explains that there are very good ways to get your hands on a good wine, at a very good price. Charlie’s wine group is generally described as “a relaxed group of wine lovers, talented experts and enthusiastic amateurs” and they’re betting that since wine is something you continually buy, you won’t mind them unearthing a general brand that maintains exceptional value and quality for you. Previously available to only those in the know or as ‘mates rates’, Charlie has partnered with Shane Barker of Taste McLaren Vale (again) to launch a new label doing just that. The Unearthing Wine Series will roll out one bottle at a time, pairing wines from “limited-allocation, highly acclaimed vineyards in South Australia”, with long standing friendly characters well known in the wine group social circles. The first wine to hit the market’s is named after Charlie herself. 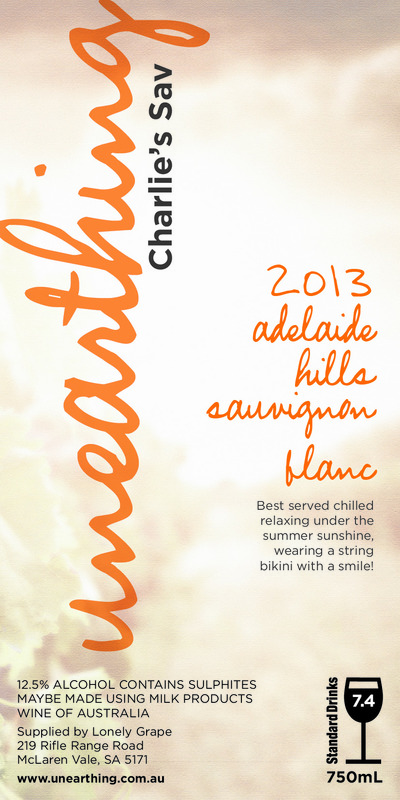 This entry was posted	on Sunday, September 29th, 2013 at 10:17 pm	and is filed under McLaren Vale, Wine. You can follow any responses to this entry through the RSS 2.0 feed. You can leave a response, or trackback from your own site.